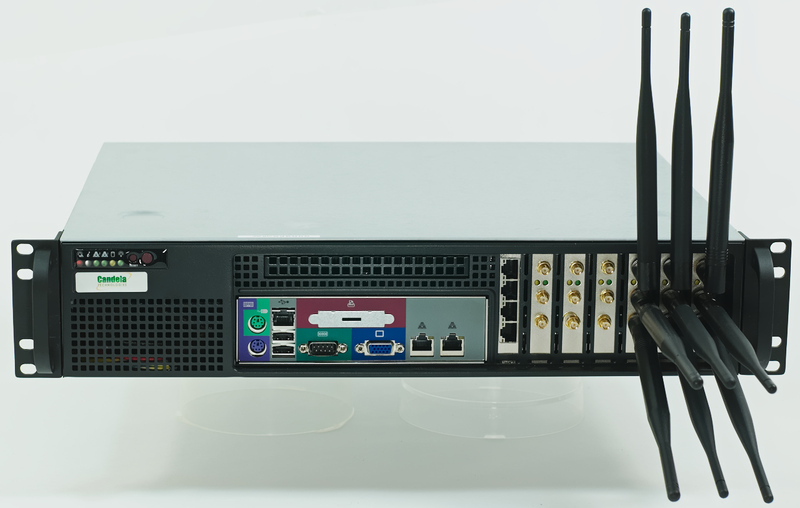 The CT525-328-2ac-1n wireless traffic generator is an excellent choice for testing Access Points and other WiFi networks. The CT525-328-2ac-1n uses a modified Wireless driver for WiFi NICs based on the Qualcomm/Atheros chipset. The ath9k (a/b/g/n) chipset NICs can support up to 200 stations per radio. The ath10k (a/b/g/n/ac) chipset NICs can support up to 64 stations per radio. Each of the Virtual Stations has its own IP address, IP port space, MAC address and routing table. The Virtual Stations can be assigned to communicate to a particular Access Point, use a particular SSID, and Open or WPA/WPA2 authentication assigned. More advanced 802.1X authentication is also included. Each radio can be configured independently of the other. Transmit power and channel/frequency is configured on a per-radio basis. Most other settings are configurable per virtual station. There are two a/b/g/n/AC and one a/b/g/n WiFi radios per CT525-328-2ac-1n and multiple LANforge systems can be clustered together for even more realistic radio interference patterns and increased traffic generation capability. All virtual stations on the same radio must be on the same frequency, but as long as the protocol supports that frequency, the multiple protocols can be used concurrently. For instance, if the radio is configured for a 2.4Ghz channel, the stations can be /b, /g, /n, or /ac. If the radio is on a 5Ghz channel, the stations can be /a, /n or /ac. The bandwidth can be configured for all protocols. For 802.11n and 802.11AC, configuring the MCS rates also determines the number of spatial streams (1x1, 2x2, 3x3, 4x4, etc.). The Virtual Stations may be configured with all of the virtual interfaces on the same subnet, or different subnets, depending on the testing requirements. When used with something like VoIP, it allows all of the VoIP calls to use the standard IP ports (with one call per virtual interface). The CT525-328-2ac-1n is a 2U rackmount system. It has 9 antennas. It will fit into a standard rackmount cabinet. No additional hardware or software is required, but it is suggested that you manage the system using the LANforge GUI on a separate machine. The CT525-328-2ac-1n can also be managed over a serial console in text mode or through a directly connected monitor, mouse and keyboard. Other Images: Some antennas, all antennas, and the rear. NOTE: This product may have a different hardware configuration than the system pictured above. Refer to your official quote for details. Connect Management Ethernet port to Management network or management PC. If connecting directly to a PC, an Ethernet cross-over cable should be used. Connect eth1 wired Ethernet interface to wired Ethernet interface on the AP or network under test. This usually is considered the 'server' side of the network. The Client side of the network will be the Virtual Stations configured on the CT525-328-2ac-1n WiFi NIC(s). Connect power to standard US or European AC power source. If using external battery pack, then connect to that instead. Install the LANforge-GUI on a separate management PC or Laptop. Windows and Linux GUIs are supported: Select the correct one from the CDROM or Candela Technologies Download page and install it. The CT525-328-2ac-1n appliance has a web server that also provides the LANforge GUIs. The CT525-328-2ac-1n should now boot. If DHCP is enabled on the Management network, the CT525-328-2ac-1n will automatically acquire an IP address. If DHCP is not available, the IP address will be set to 192.168.1.101 by the LANforge scripts. Start the LANforge-GUI on the management PC and click the 'Discover' button. It should find the CT525-328-2ac-1n appliance and add the IP address to the drop-down box in the Connect widget. Press 'Connect' and you will be connected to the CT525-328-2ac-1n. Select the Port Mgr tab in the GUI. Double-click on the device called 'wiphy0'. This is the Radio device, and should be configured for the correct, channel, country-code, etc. Next, select one or more of the Virtual Station interfaces and click 'Modify'. Enter the correct IP address information, SSID and WPA/WPA2 password (if Enabled). After applying these changes, the Virtual Station interface should associate with the AP and be ready to send traffic. You may create up to 328 Virtual Station interfaces per CT525-328-2ac-1n with the 'Create' button. Once the interfaces are configured correctly, you can click on the Layer 3, VOIP/RTP and other LANforge-FIRE related GUI tabs and configure/modify/start/stop particular traffic patterns that utilize the virtual stations and wired Ethernet interface. In most cases, you will want one of the FIRE endpoints to be on the wired interface and the other to be on the WiFi Virtual Station interface. It is also valid to generate traffic between two Virtual Station interfaces. The GUI Plugins menu (and right-click on some tables) provides some plugins to do automated testing and reporting. Contact support if you have suggestions for improvements. Any GUI modifications take place immediately after you click 'Submit'. Layer 3: IPv4, IPv6, UDP/IP, IGMP Multicast UDP, TCP/IP. 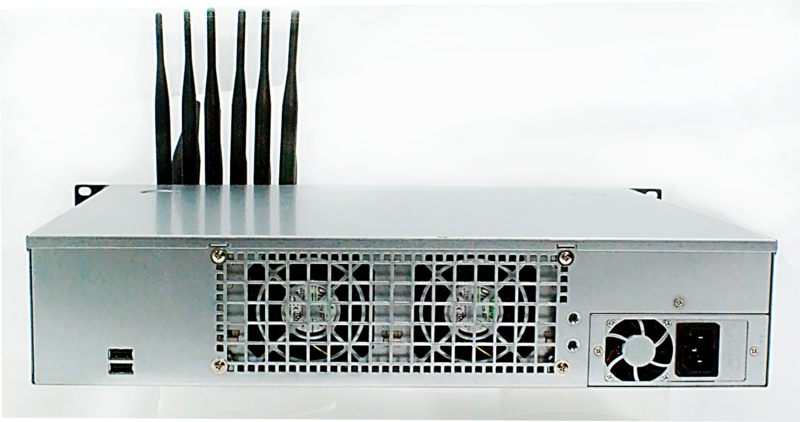 802.11a/b/g/n Wireless Station (up to 200 per machine). 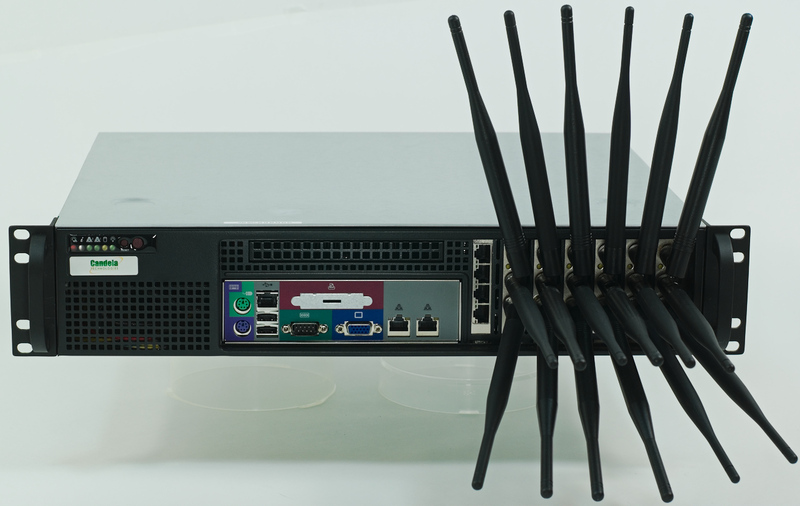 802.11a/b/g/n/AC Wireless Station (up to 128 per machine). Layer 4: TELNET, PING, DNS, SMTP, NMAP (via add-on script). 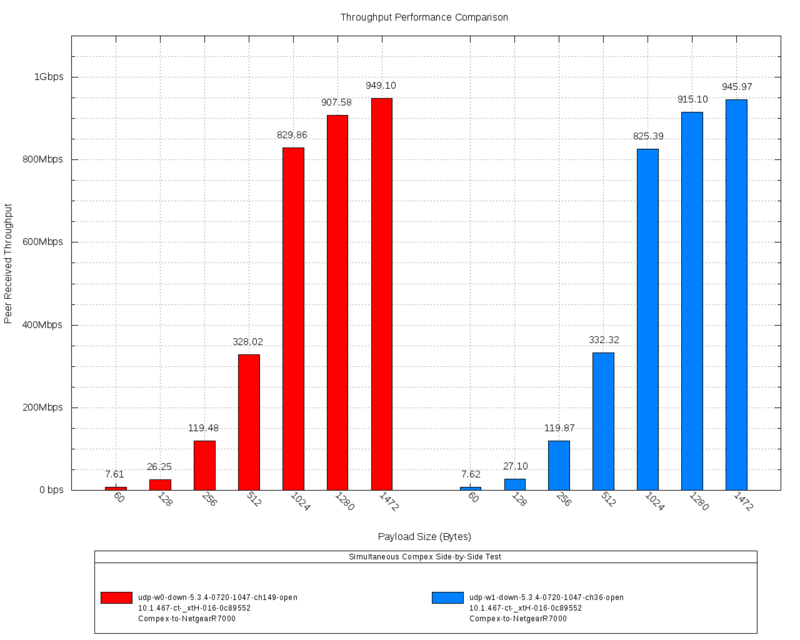 File-IO: NFSv3, NFSv4, CIFS, iSCSI. Supports up to 1000 concurrent TCP connections with base license package. Supports real-world compliance with ARP protocol. Supports ToS (QoS) settings for TCP/IP and UDP/IP connections. Uses publicly available Linux and Windows network stacks for increased standards compliance. Utilizes libcurl for FTP, HTTP and HTTPS (SSL), TFTP and SCP protocols. Supports file system test endpoints (NFS, CIFS, and iSCSI file systems, too!). File system mounts can use the virtual interface feature for advanced testing of file server applications. Supports custom command-line programs, such as telnet, SMTP, and ping. Comprehensive traffic reports include: Packet Transmit Rate, Packet Receive Rate, Packet Drop %, Transmit Bytes, Receive Bytes, Latency, Jitter, various Ethernet driver level counters, and much more. Supports generation of reports that are ready to be imported into your favorite spread-sheet. Allows packet sniffing and network protocol decoding with the integrated Wireshark protocol sniffer. GUI runs as Java application on Linux, MAC and Microsoft Operating Systems (among others). GUI can run remotely, even over low-bandwidth links to accommodate the needs of the users. Central management application can manage multiple units, tests, and testers simultaneously. Includes easy built-in scripting for iterating through rates and packet sizes, with automated reporting. Also supports scriptable command line interface (telnet) which can be used to automate test scenarios. Perl libraries and example scripts are provided! Automatic discovery of LANforge data generators simplifies configuration of LANforge test equipment. 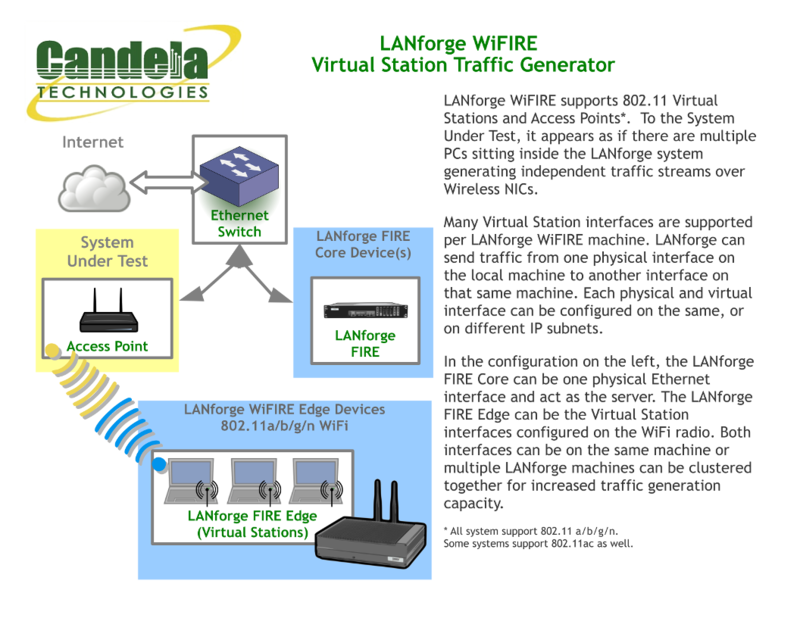 LANforge traffic generation/management software is supported on Linux and MS Windows. High-End Intel Multi-Core 2U rackmount server. Operating System: Fedora Linux with customized Linux kernel. Up to 28 10/100/1000 Ethernet ports on PCIe bus. Additional interface for management. High-availability Ethernet hardware bypass option available. 7 PCIe low profile slots. Optional NICs include: 4-port 10/100/1000 copper, 2-port 10/100/1000 copper, 2-port 1Gbps fibre, 2-port 10Gbps fibre, 2-port 10Gbps copper (CX4), 802.11a/b/g/n WiFi NIC, 802.11a/b/g/n/AC WiFi NIC. 16 GB or more RAM. 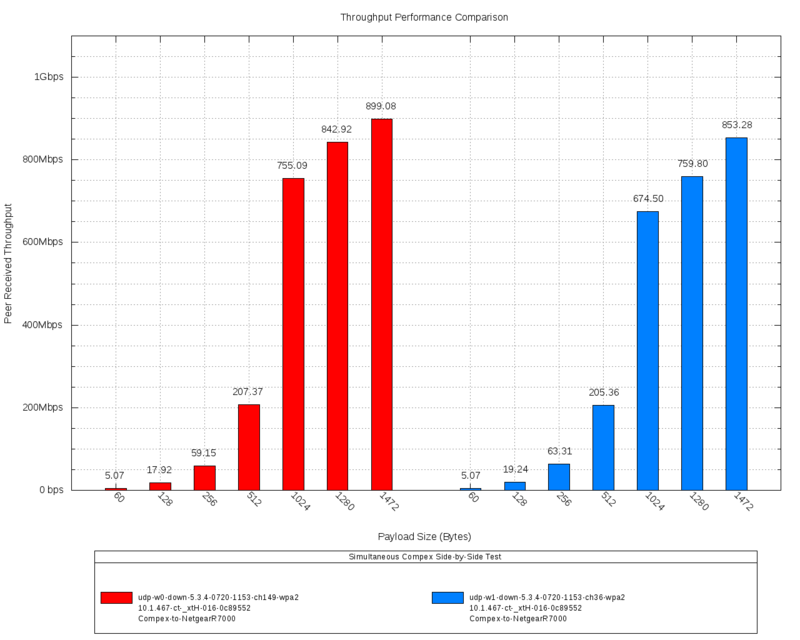 120 GB or larger SSD Hard Drive. Weight: 20.4 lbs or 9.3 kg. Dimensions: 17 x 18 x 3 inches (18-inch deep standard 2U rackmount server) Metric: 432 x 457 x 76 mm. Estimated Power Usage: 2.1 Amps @ 120 VAC under load, 1.4 Amps idle. Two Atheros/Qualcomm 802.11a/b/g/n/AC and one a/b/g/n 3x3 MIMO NICs with three external antenna each. Supports up to 328 virtual stations (200 per a/b/g/n radio and 64 per a/b/g/n/AC radio). Antenna-to-Radio association: See labels on chassis. FIRE Connections: Base FIRE license includes 1000 active connections. WiFi RF Attenuator: Adjust WiFi signal strength in a controllable manner. RF Noise / Radar Simulator: Simulate RADAR pulses and other RF noise. SMA RF Cable Bundle: Used to cable LANforge WiFIRE radios to device-under-test. VOIP: Each concurrent call over the included package requires a license. Armageddon: Each pair of ports requires a license if not already included. External battery pack: 12+ hours for CT520, CT523, CT92X and other platforms.